Henley Rowing Club dominated their home event on Saturday with 13 wins and 10 second places in the Henley Sculls head race. With the event running at full capacity, the weather held for perfect head racing over the 3km course, bringing competition from as far afield as Nottingham, Bristol and Worcester. The local club took five victories in the men’s events. Dave Read was the fastest sculler of the day, winning the Elite singles event in a time of 12 minutes and 33 seconds , with Rob Wilson taking the Masters C singles victory and Sean Collinson winning the Masters D singles category. Andy Pettican and Stan Admiraal won the IM2 doubles event in the morning division in a winning time of 12 minutes and 7 seconds against a competitive field of five boats. Admiraal then competed in the afternoon division to take his second victory of the day in the Novice singles with the fourth fastest single sculling time of the day. The Junior Women’s Squad continued their tremendous start to the season with a further 8 wins on home water. In the WJ14 quads, Henley took first and second places comfortably, with Maidenhead finishing third and fourth in a field of 8 boats. The winning crew of Emma Gray, Amelia Crick, Sophia Hahn, Livie Petersen, and cox Emeline Warner led their fellow Henley crew of Ella Nolson, Phoebe Fletcher, Jess Arlet, Felicity Parfitt and cox Ester Morgan into second place by 9 seconds. In a busy field of 32 boats in the WJ15 singles event, the Henley girls dominated the competition. Lottie Orr was victorious with the fastest time of 14 minutes and 49 seconds, with Mary Wright, Georgie Robinson Ranger and Issy Jonsson finishing in second, third and fourth places respectively. Georgie Robinson Ranger and Mary Wright then competed in the WJ15 doubles, winning the event in a time of 14 minutes and 19 seconds. 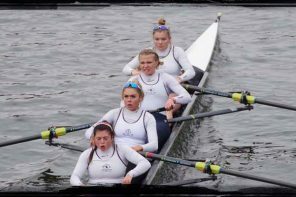 The WJ15 coxed quad of Tilly Lock, Issy Jonsson, Lottie Orr, Ruby Brown and cox Freya Reid won ahead of Ross Rowing Club and Headington School Boat Club. The WJ16 singles, Lauren Kay took victory against 26 other scullers, having previously won the WJ16 doubles event with Ella Morgan in the morning division. The squad had two further victories in the older girls events, with Hattie Orr and Ellie Thompson winning the junior women’s doubles in a time of 13 minutes and 26 seconds, a lead of 22 seconds over Latymer Upper School. 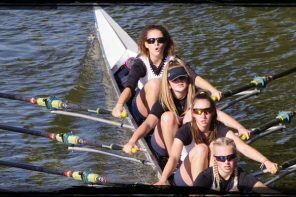 In a rare occurence for Head races, the junior women’s quad of Lauren Edwards, Kryssie Steiger, Alexis Perkins and Emma Lister were tied with Weybridge Rowing Club in their respective times over the 3km course and both crews were awarded victory medals. The club recorded 10 second places on the day. 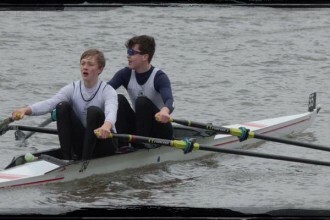 The junior men’s squad had three second places in the J14, J15 and J16 quad events against highly competitive fields. 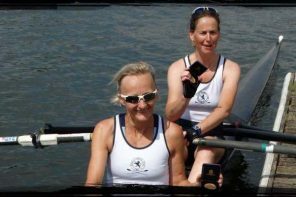 The Masters women’s boat of Karen Edwards, Candice Chambers, Helen Murphy and Niki Orr lost narrowly to a crew from Marlow Rowing Club. In the Master’s singles, Hillyard and Lincoln recorded second place times in the B and H/J categories. Junior Kryssie Steiger performed well in the senior women’s IM3 singles to take second place, and the double of Victoria Carver and Rachel Alder took second in the women’s IM2 event.